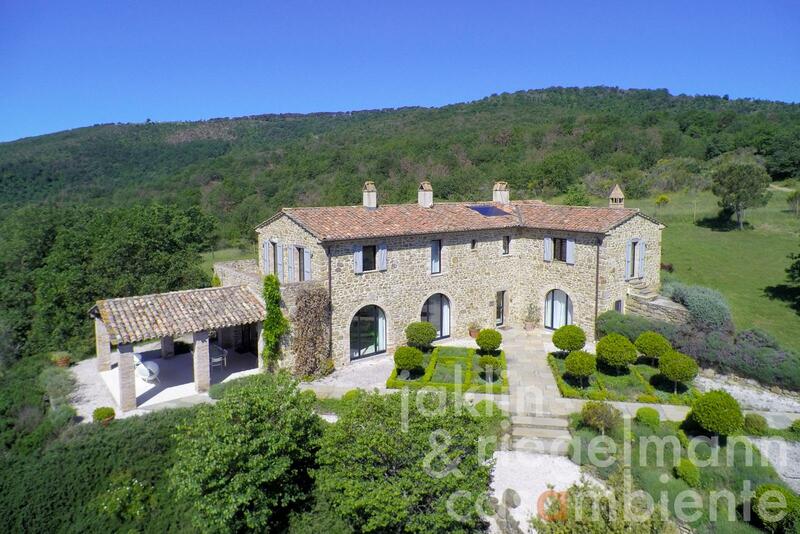 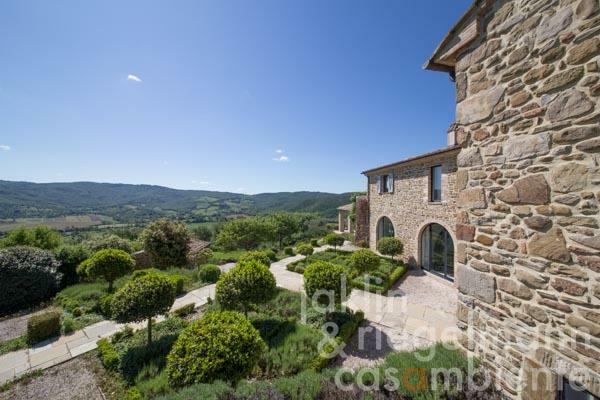 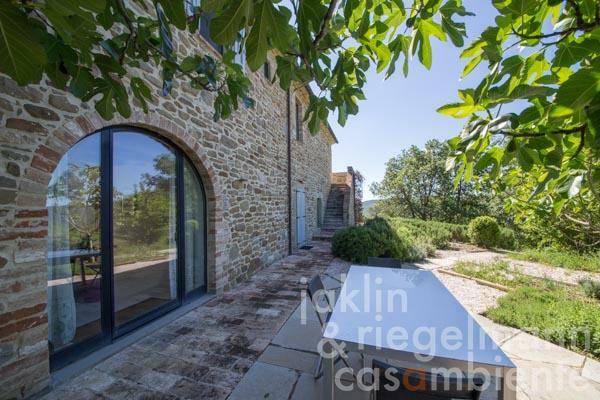 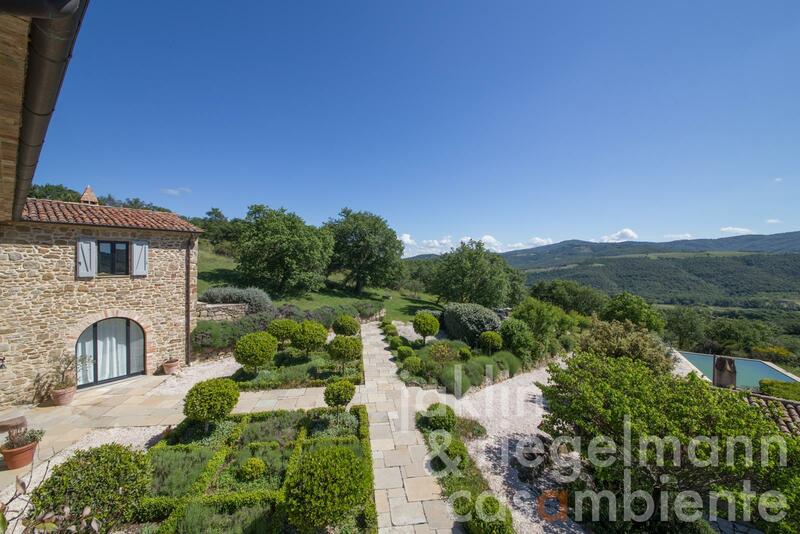 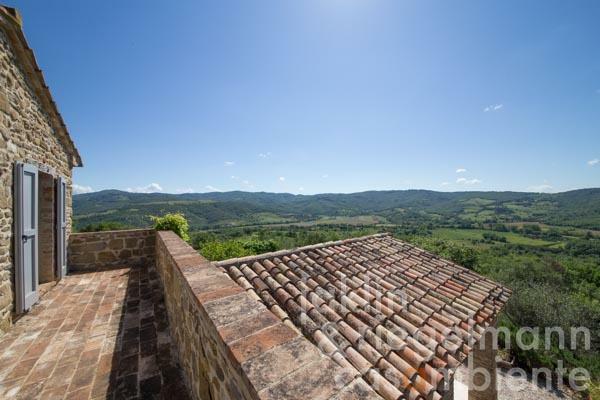 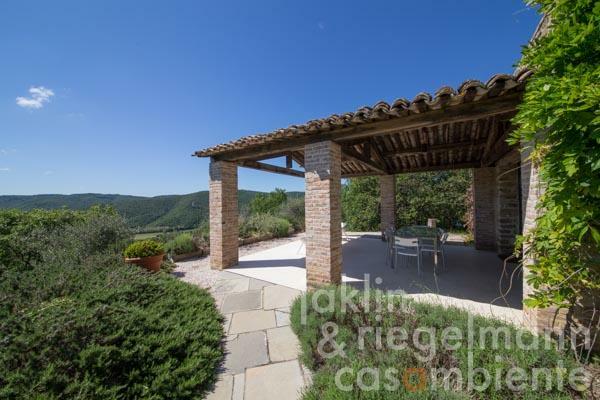 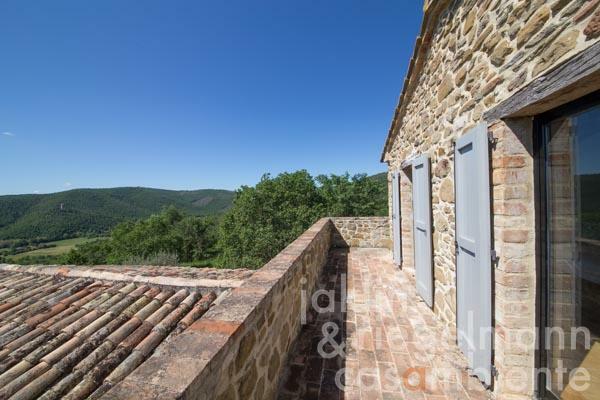 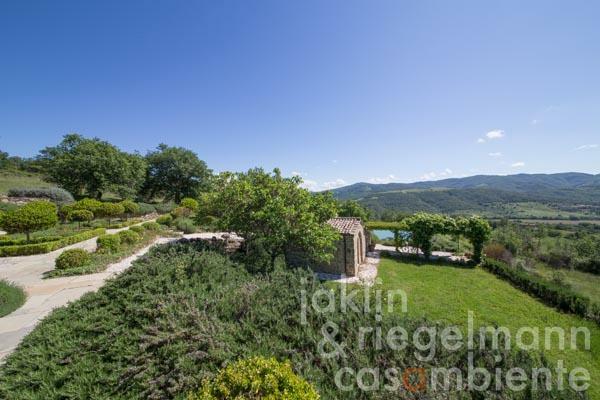 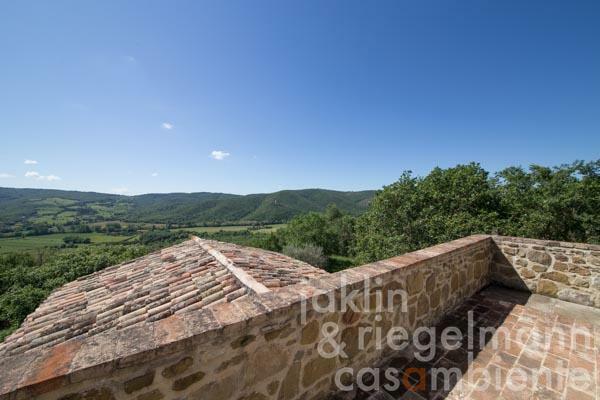 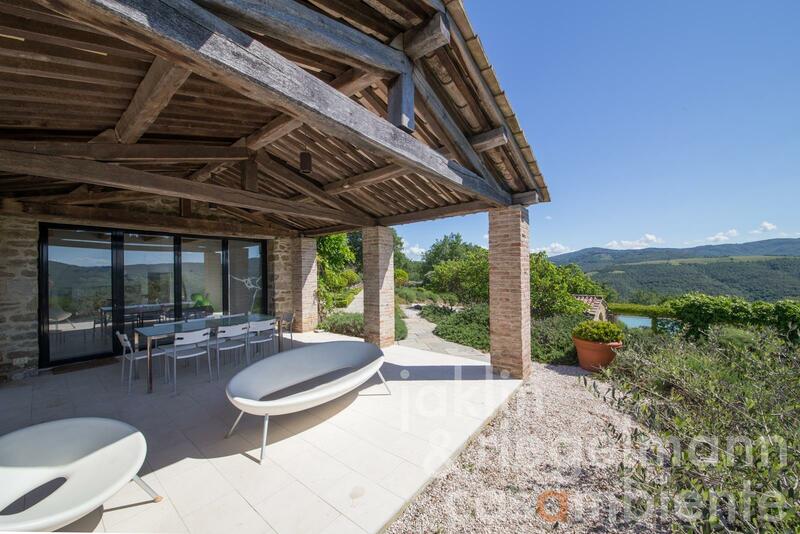 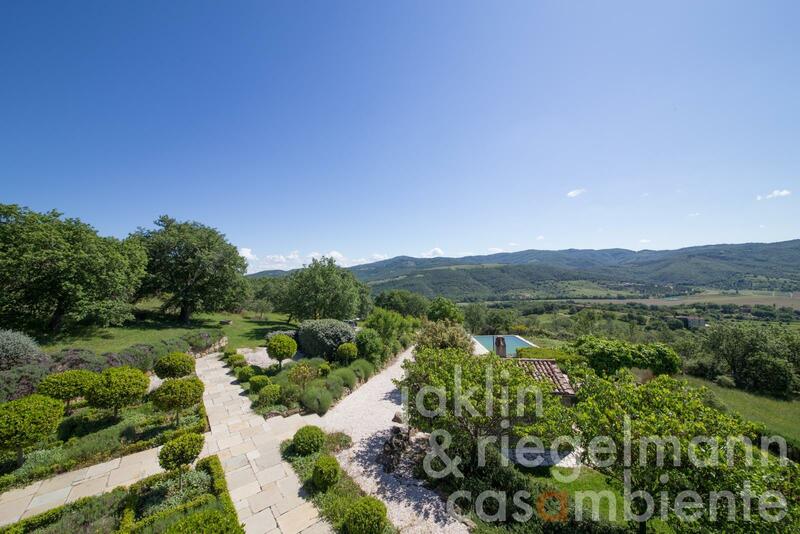 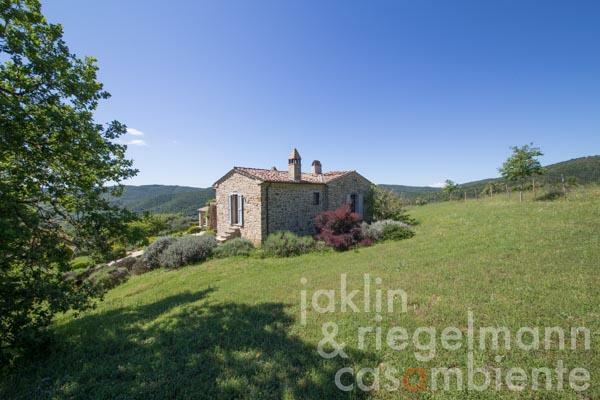 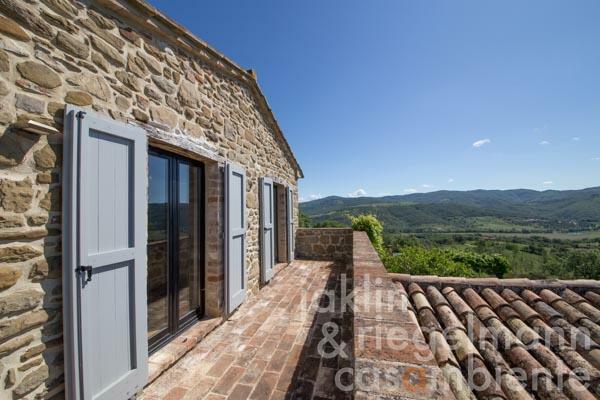 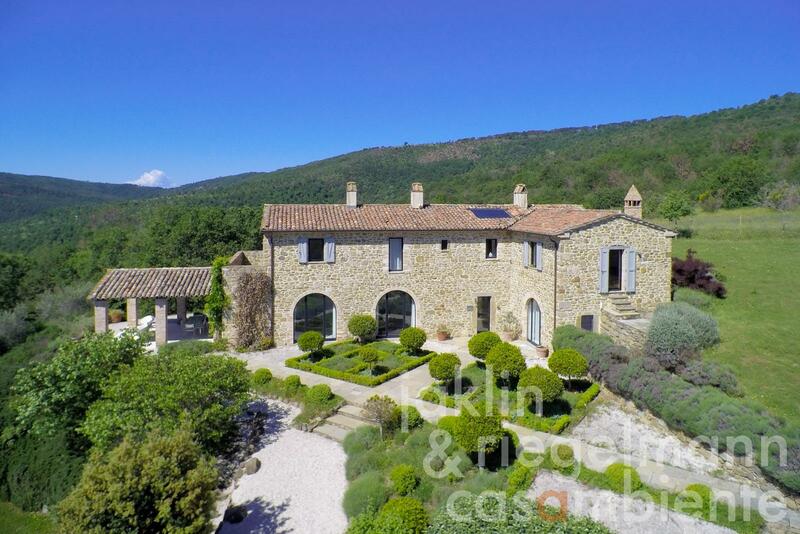 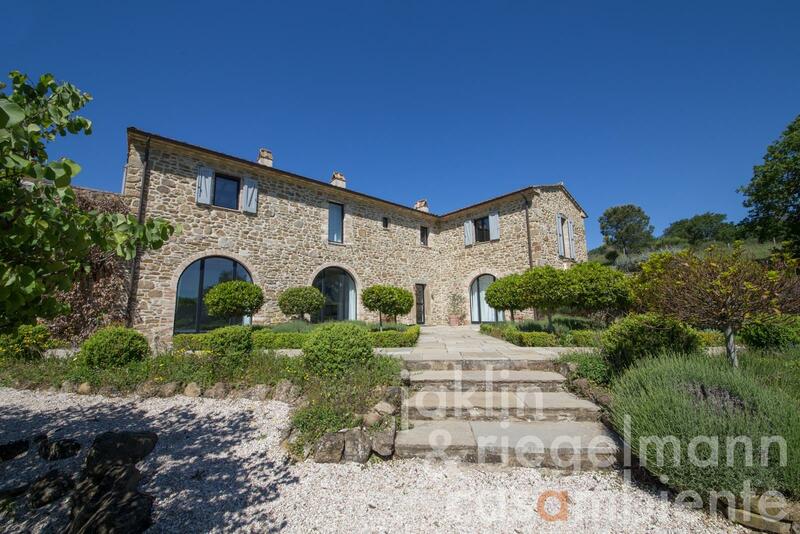 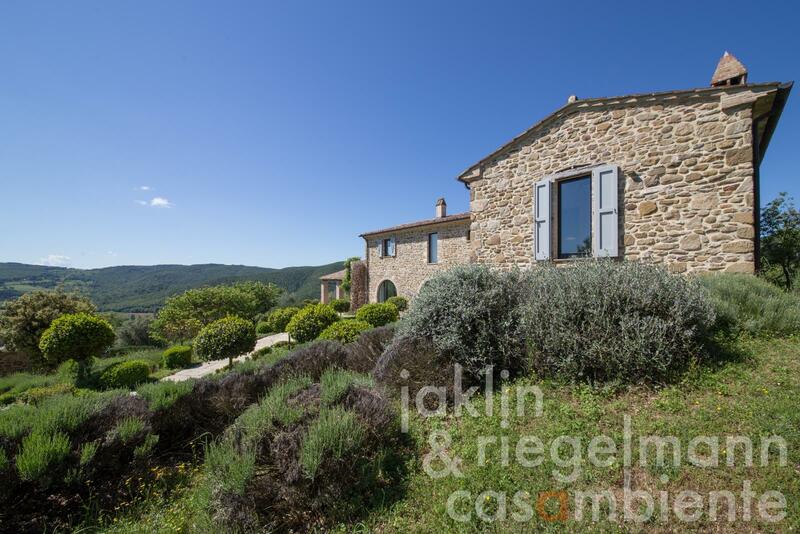 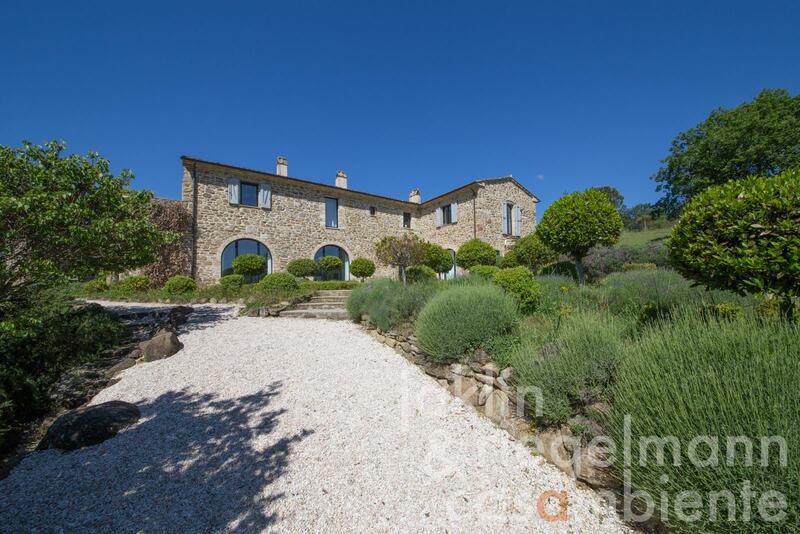 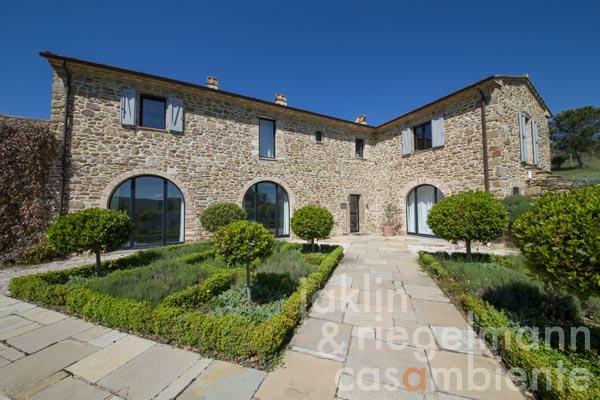 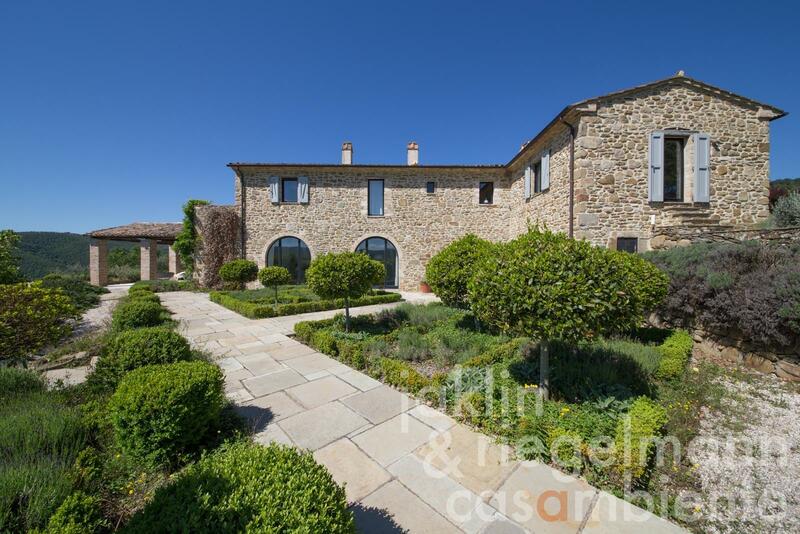 This beautifully restored Italian country house for sale is situated close to the border of Tuscany and Umbria and within easy reach of Lago Trasimeno. 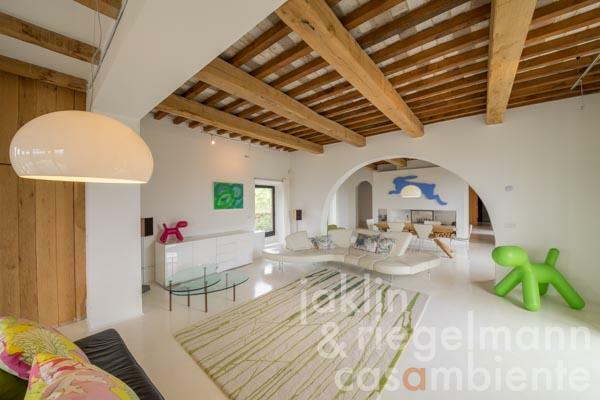 The L-shaped main building offers about 325 m² of living area on two floors, a small annexe is located by the infinity edge swimming pool. 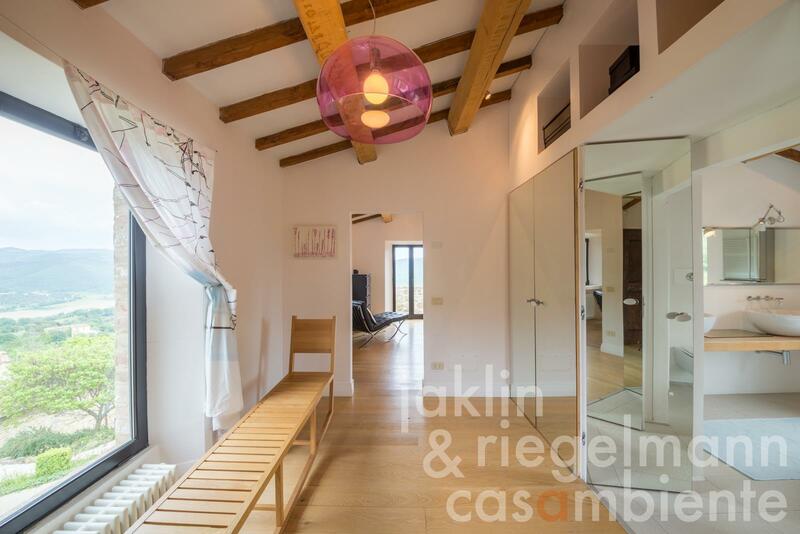 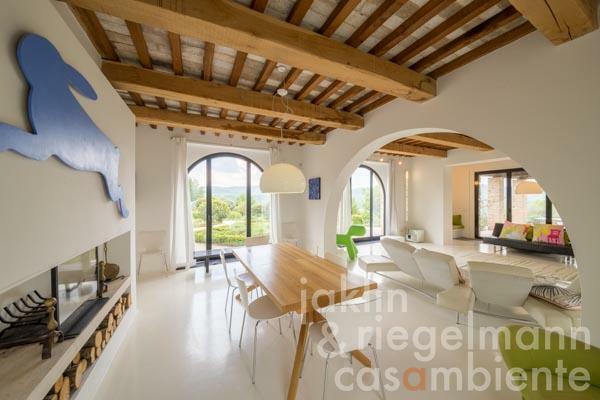 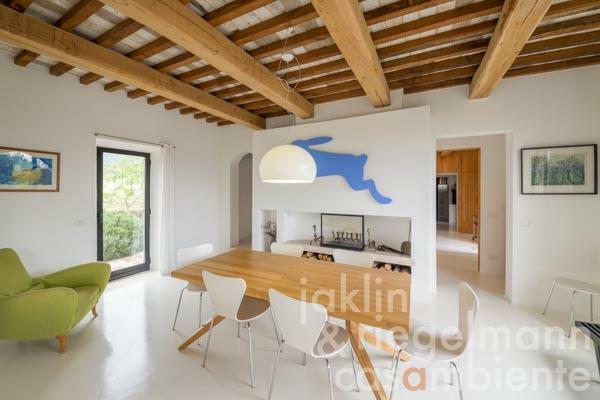 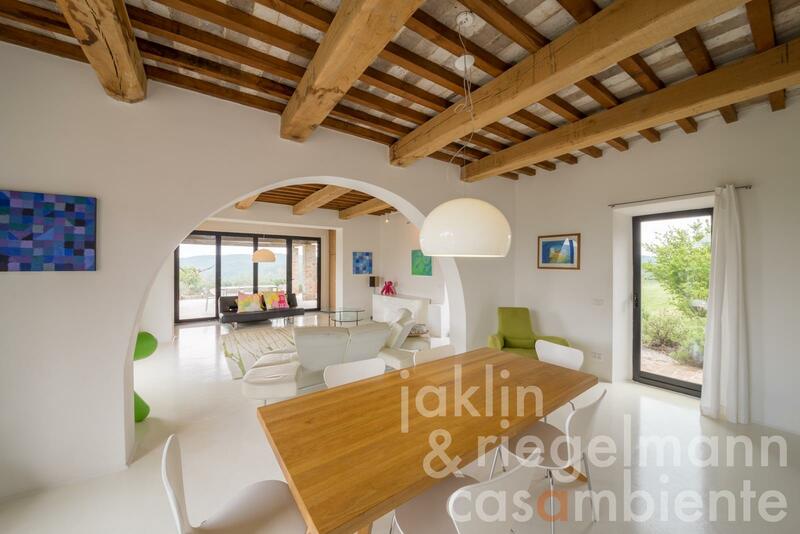 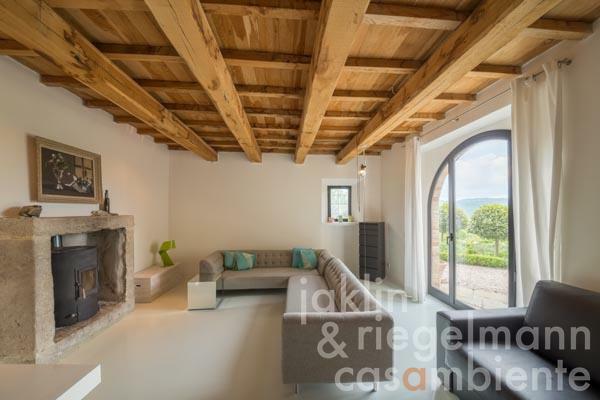 The property was completely restored by the present owner with a focus on clean lines and brightness, very well aligned with the shape and appearance of a traditional Italian country house. 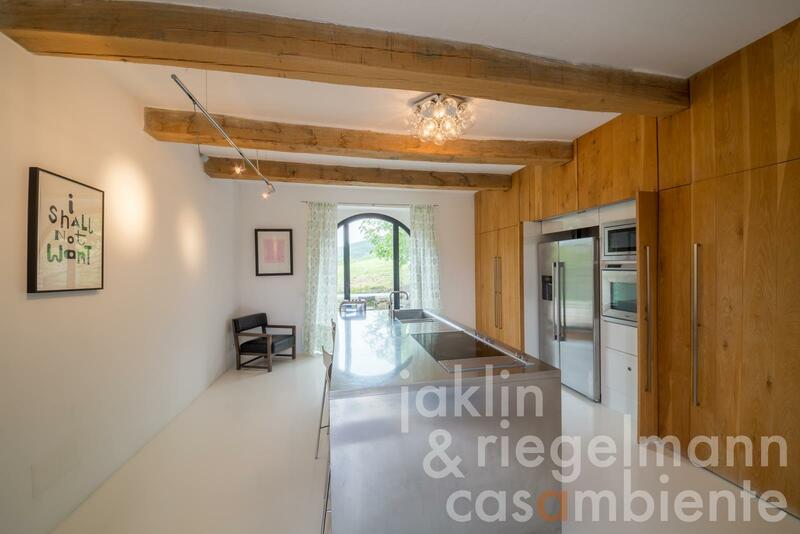 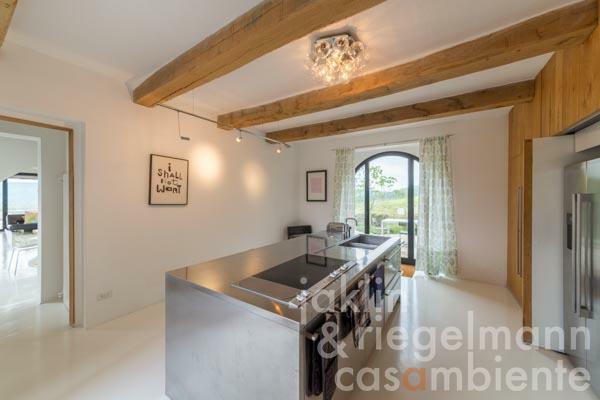 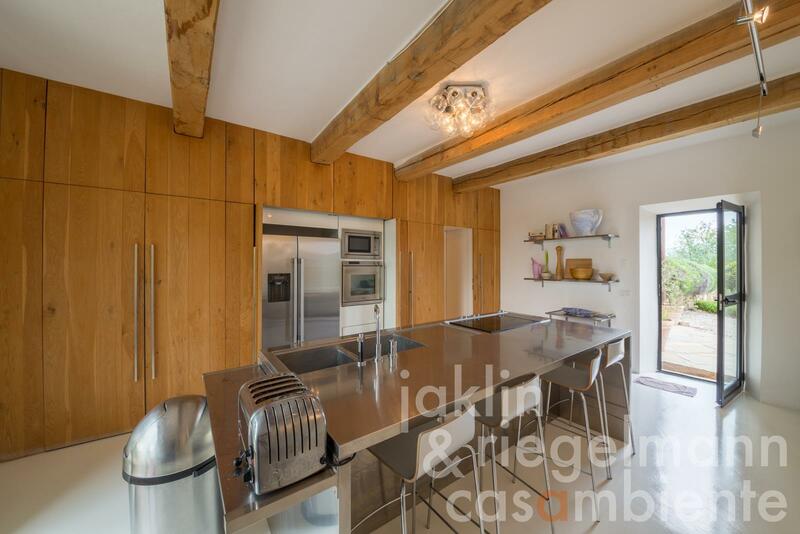 On the ground floor level is a modern kitchen with Gaggenau appliances and direct access to one of the terraces and the garden, and a very bright dining and living room. 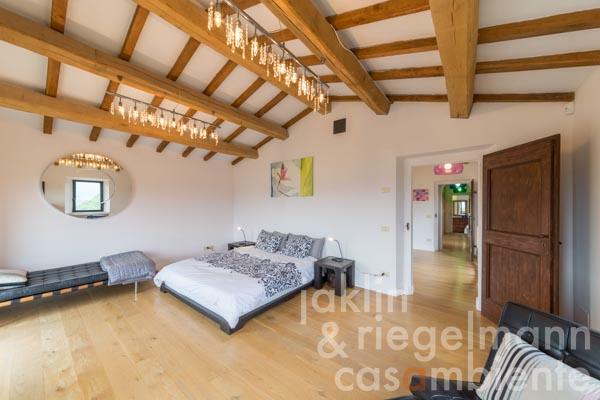 There is an open fireplace in this room. 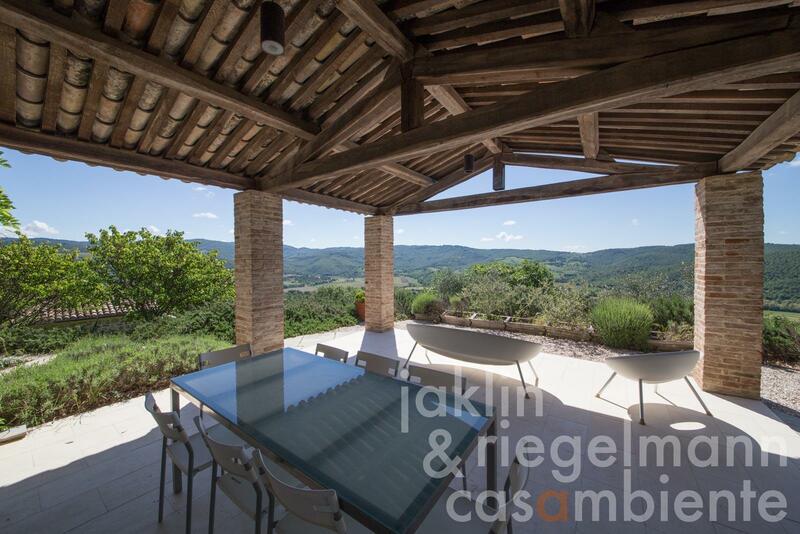 From the living area, glass doors lead out to a spacious covered terrace, a fabulous place for al fresco dining. 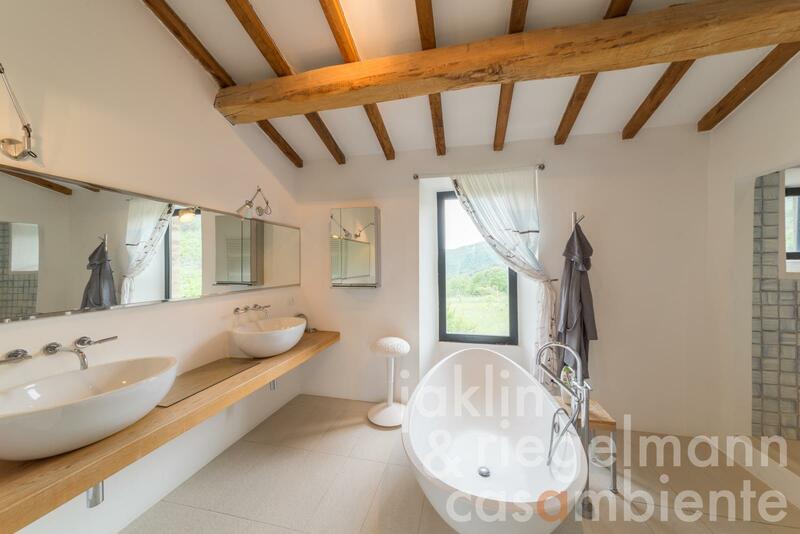 Next to the kitchen is a useful storage space, a bathroom, and another large room, also with access to the garden, which could either be used as a reception room, or alternatively, as an additional bedroom. Stairs lead to the first floor with three bedrooms, each with a bathroom en-suite. 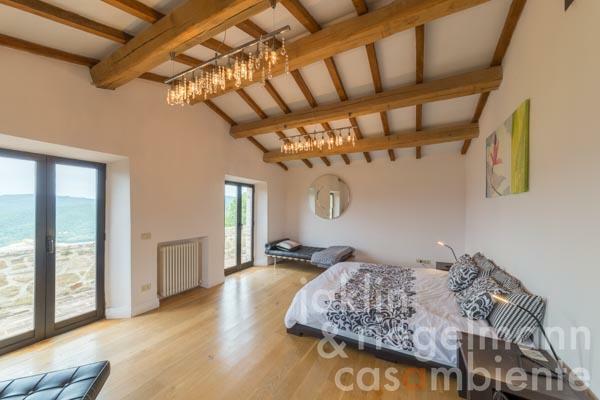 The master bedroom has the benefit of a separate dressing room with built-in cupboards, and a wonderful terrace running along the full width of the house. 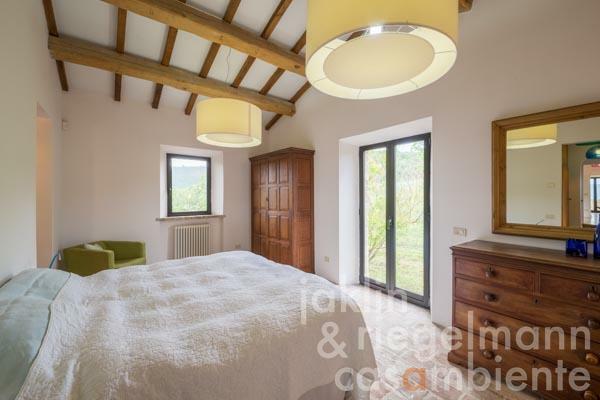 There is also a smaller room that could serve as a dressing room for one of the other bedrooms, but is currently used as an extra bedroom as it shares a bathroom, bringing the number of potential bedrooms up to five in total. The infinity edge swimming pool is solar heated. 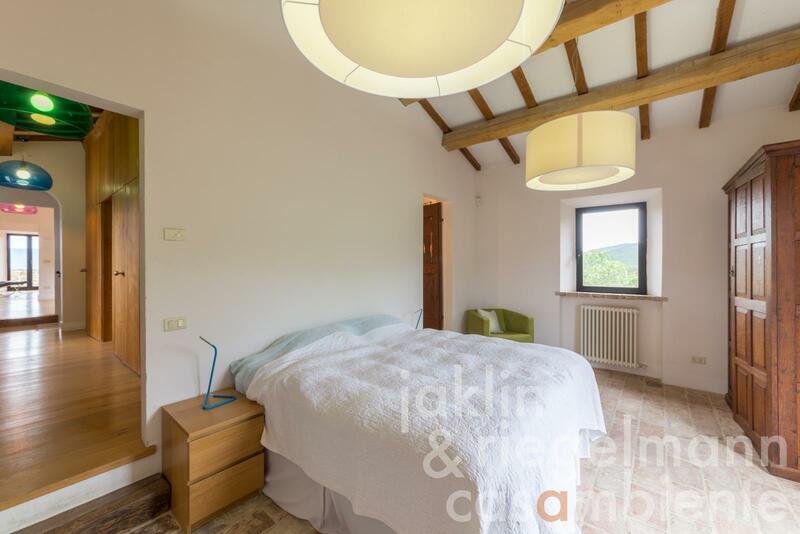 The annexe by the pool offers a shower and laundry room. 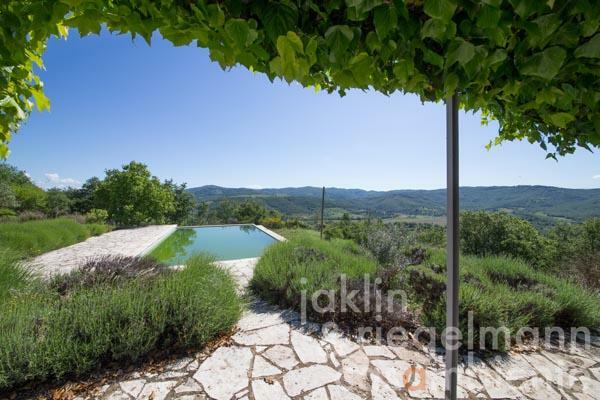 The garden is an eye-catcher. 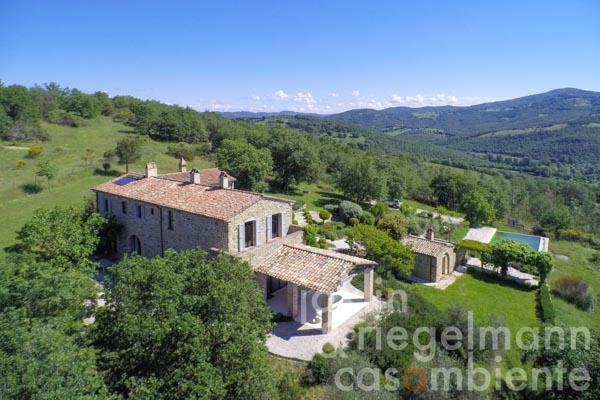 The villages Lisciano Niccone and Mercatale are just a few minutes away by car. Italy, region Umbria, province Perugia, municipality Lisciano Niccone. 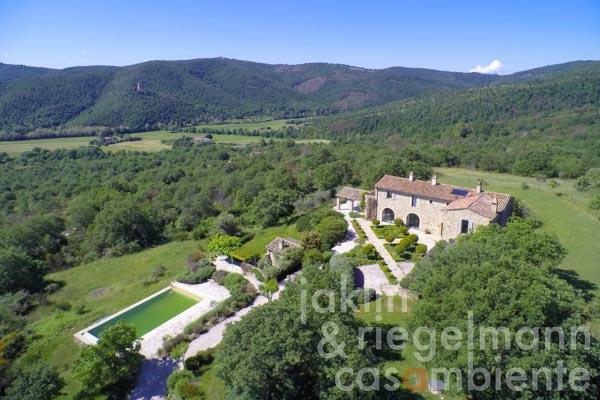 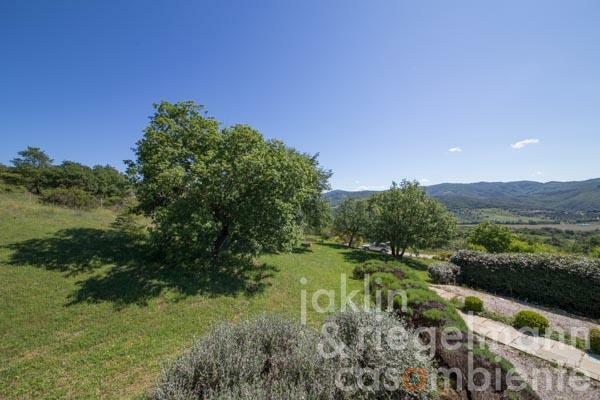 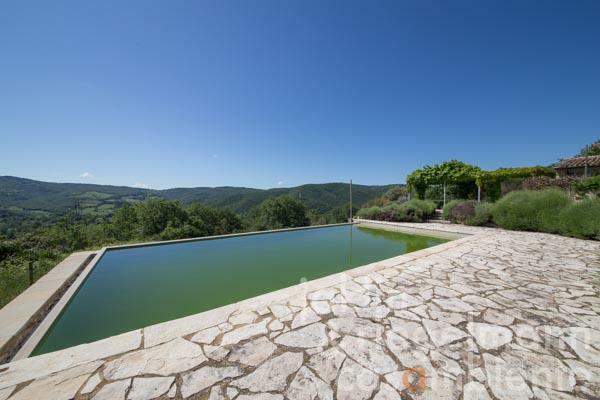 6,500 m² garden and meadows. 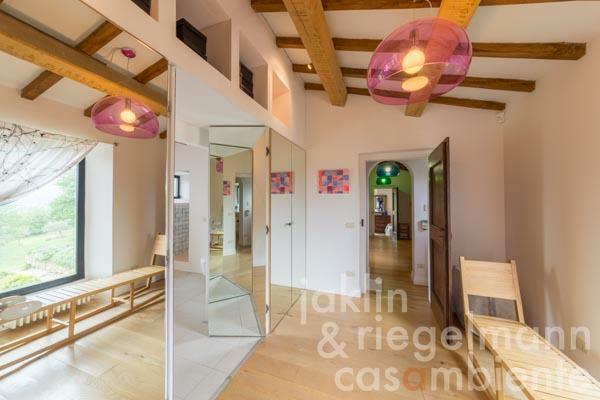 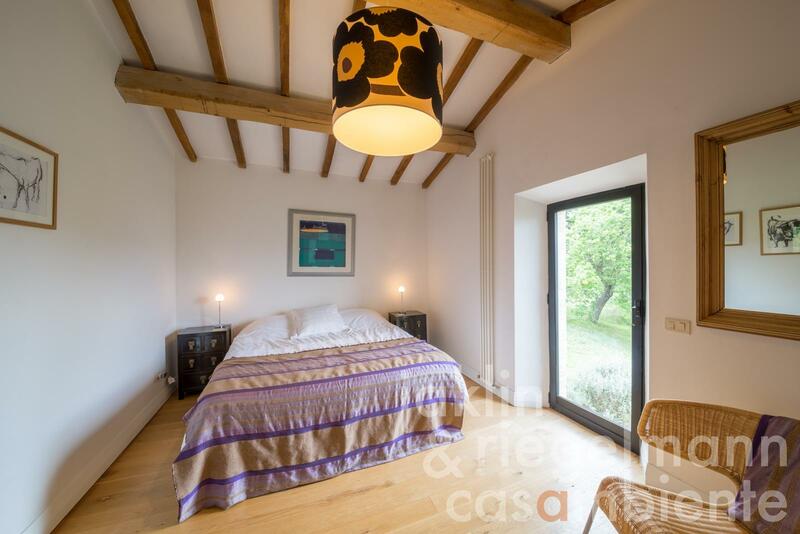 Electricity, own well water, central heating, solar thermal system, underfloor heating, fireplace, gas tank, broadband internet access, alarm system, swimming pool, private parking, terrace, garden.